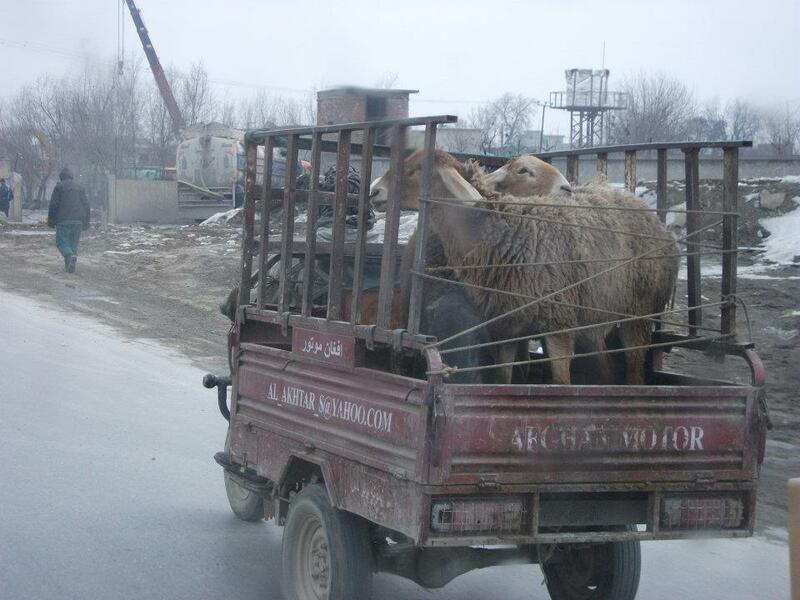 Driver and Crewman in Kabul: Let’s get on with it! 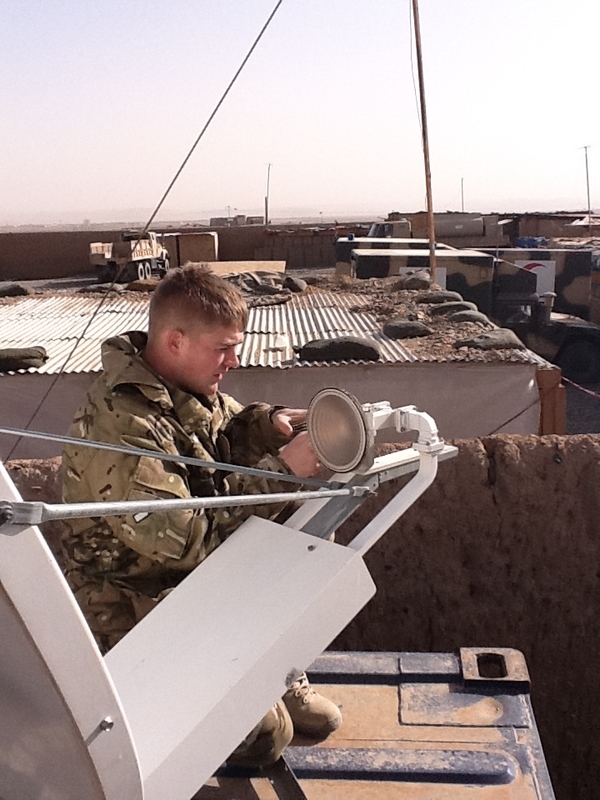 Signaller Tonkinson is a Communications Logistic Specialist (CLS) currently stationed with 1st United Kingdom Armoured Division Headquarters and Signal Regiment (1 (UK) ADSR) based in Herford, Germany. She is deployed on Op HERRICK 15 where she is employed as both a driver and crewman as part of Souter Force Protection Transport Company (SFPTC), stationed at Camp Souter in Kabul. It’s been a good week in comparison with last week; the new CO arrived so we have spent a lot of time driving him around the city showing him the various locations and the area in general. There were some weird sights seen whilst driving around, a cyclist with a bull’s head tied to the back of his push bike and a tuck tuck (a three wheeled motorbike crossed with a van) with some sheep on the back doing about 50mph. I have never seen 50mph sheep before! There has also been quite a lot of routine work to do on the vehicles, the lads in the LAD have started their R&R and there’s been extra work required due to the wintery weather conditions. Signaller Eltringham finally got off the ground for his R&R only a few days late but at least he got there. He was closely followed by Sgt Locking and the OC Major Veron, who got on the first available flight, going slightly early just in case! Typical, the seniors escape for R&R just when things turned nasty within our area! The Americans made a huge mistake of burning the Koran, an unforgivable act in Afghanistan. Unfortunately our new MTP uniform is the same colour as the American Army. In the past we have been mistaken for the Americans while on foot patrol. As you may have seen on the TV the Afghan population reacted with riot’s around Kabul City, attacking American camps in protest at what they had done. Here at Camp Souter the threat level went through the roof, extra guard posts were stationed and extra security at the front gates as the protesters moved from camp to camp around the city. This was the real deal! Our multiple was on Quick Reaction Force (QRF) constantly at 15 minutes notice to move, MAXIMUM! As the protests escalated I was temporality stationed on an extra guard post until re-enforcements arrived. The re-enforcements came in the form of anyone on camp who wasn’t on mission-critical duty. Basically anyone resting was to arm themselves and be prepared for tasking, everyone was up and ready. I stood on guard listening to the crowds of Afghan’s chanting in the distance, firing their weapons to intimidate us and I observed the fires being started which created black smoke attempting to prevent the security cameras from seeing what was going on. I could then hear the crowds getting closer, heading our way. It came over the radio that the crowds where moving towards the end of the road where our camp is based. At this point I was replaced and ordered to return to my multiple who were waiting at the front gates armed and with riot gear and with a dog handler at the ready with an attack dog. Getting prepared with riot gear, dog and handler. The order came to stand down. It took a while for everyone to wind down, we were still on QRF until the next evening when we would change over to guard. Over the next few hours the attack alarm went off a few times. Whenever it went off we rushed around to prepare to go out to the gates only to find it was a false alarm. Over the course of the next few days everyone was on edge waiting for something to happen, luckily there has been no trouble at Camp Souter yet. 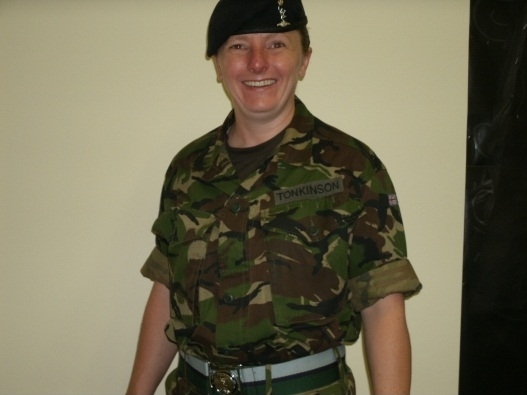 Sig Tonkinson is a Communications Logistic Specialist(CLS) currently stationed with 1st United Kingdom Armoured Division Headquarters and Signal Regiment (1 (UK) ADSR) based in Herford, Germany. 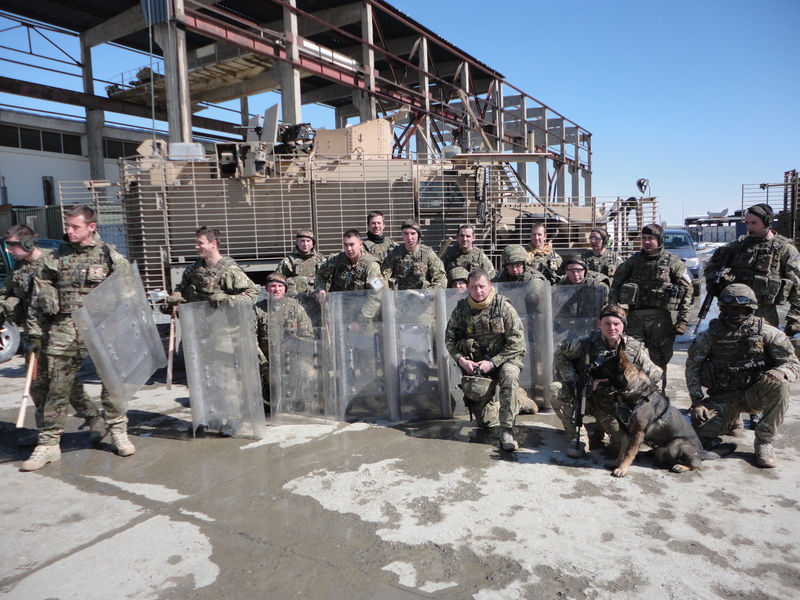 She recently deployed on Op HERRICK 15 where she is employed as both a driver and crewman as part of Souter Force Protection Transport Company (SFPTC), stationed at Camp Souter in Kabul. The snow is still here but now it is causing a lot more problems, the airport has cancelled flights, which has put a downer on those waiting to go home on R & R. This has meant that LCpl Terri Cartledge has spent her 21st birthday on camp Souter, I suppose it’s been one to remember, for all the wrong reasons! Our new honourary member to the multiple, our friendly mouse (Mickey), has given us some giggles this week, he left one room, asually strolled down the corridor and disappeared into Craftsman ‘bums’ Brundel’s room. Upon entry Mickey conducted an immediate U-turn as if to say “No way, I am not living in there”’. Mickey obviously has high standards and the luxury of being able to choose who he wants to live with. As yet no one has managed to take a snap shot of Mickey – he seems a little camera shy and quite nimble on his feet. Hopefully the snow will lift soon to allow people home on R & R, and particularly for Cpl Matt Wright who while here found out he is to become a dad. It’s been a quiet week, with us all having to stay inside camp for the majority of the time. The suicide bomb threat has gone up so there is to be no unnecessary movement outside of camp. Luckily we managed to get the next sortie of lads off on their R & R before the limitation was put in place. Any movement outside the gates now needs to be authorised by our higher formation. In some aspects this is not a bad thing, as we have managed to get some more hands-on training and experience with the vehicles. On opening the doors to the first vehicle, inside was not what I expected to find – I was greeted by a mound of snow! Someone had forgotten to close the gunner’s hatch and the snow had come down heavily overnight. After a couple of hours clearing the snow we were back on track. The vehicle inspection started by checking all liquid levels, for example: oil, screen wash, transmission fluid, water coolant and break fluid. We soon moved on to tyres, seatbelts, greasing and oiling the moving parts and finally headlight checks the list goes on – basically it’s a mini MOT. It was great to get my hands dirty and being under a vehicle adds to the experience of being a driver – it was good getting to know my vehicles and understanding them in much greater detail. The week slowly came to an end and the snow is still on the ground presenting us with additional problems of ice on the road, especially when driving the 15-tonne Enhanced Platform Loading System (EPLS). Due to the diverse conditions that I am facing, I now feel that I am a lot better at driving the EPLS than before I deployed on tour. 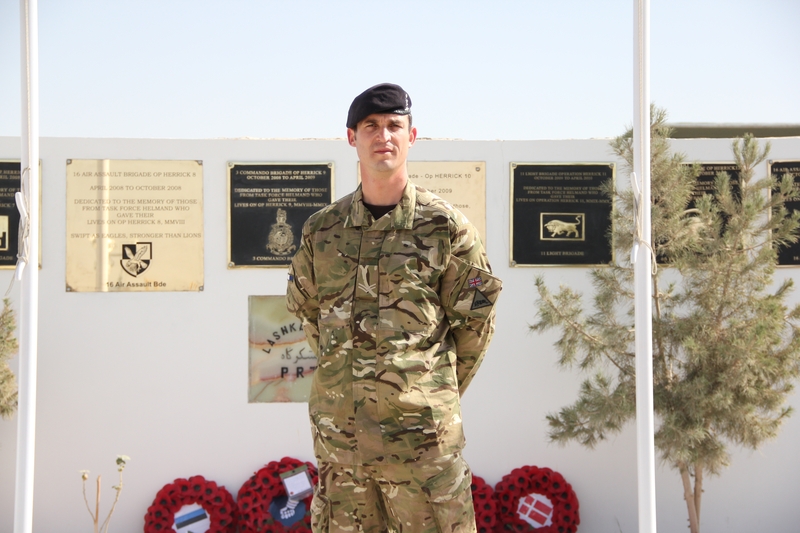 Sig Tonkinson is a Communications Logistic Specialist (CLS) currently stationed with 1st United Kingdom Armoured Division Headquarters and Signal Regiment (1 (UK) ADSR) based in Herford, Germany. She is deployed on Op HERRICK 15 where she is employed as both a driver and crewman as part of Souter Force Protection Transport Company (SFPTC), stationed at Camp Souter in Kabul. Hi, let me tell you a little about myself and bring you up to speed, my name is Signaller Tonkinson and I am a Communication Logistic Specialist in 1 United Kingdom Armoured Division Headquarters and Signal Regiment [1(UK)ADSR]. I am part of Souter Force Protection Transport Company (SFPTC), this is my story so far. I arrived in Herford,Germany, 10 months after my phase two training; to say I hit the ground running would be an understatement. 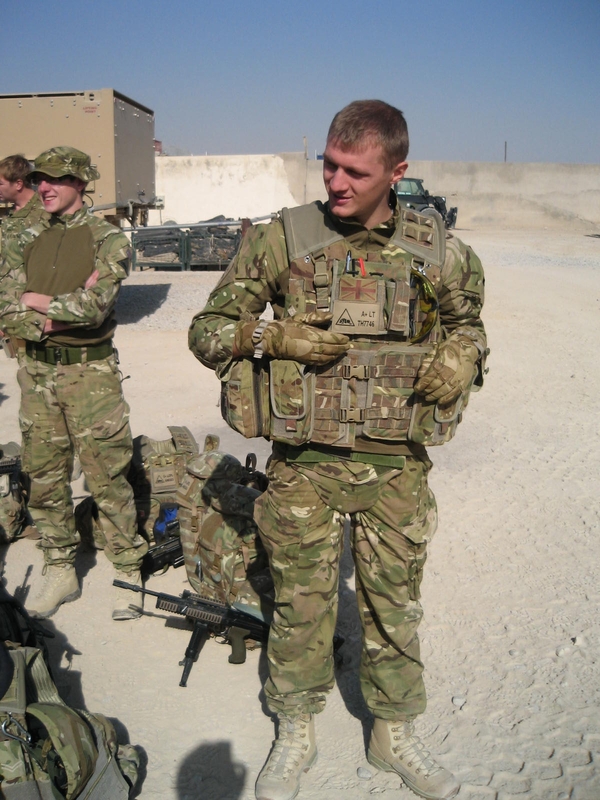 Before September was out I would be qualified as a Team Medic and fired every weapon from a GPMG down to a pistol. On top of that I was issued with all my tour kit went on two exercises, driven a land rover in the pitch black with night vision goggles and manoeuvred a children’s go cart round an obstacle course while blindfolded! There was little respite in October as I had to pass my Enhanced Palletised Loading System Operators Course (EPLS). My job as part of SFPTC would be a driver, but not just any driver. I would be trained in all lower rank roles, foot patrol, top gunner and the very important team medic. Despite all this training I felt excitement and fear rolled into one, after all I was the new girl! That fear was tamed a little when I realised I wasn’t the only one deploying on tour for the first time. More importantly the lads had become my adopted family. Oh, and there was another girl going to. Before I knew it, it was early November and the tour was upon me. My first impression of Camp Bastion was a good one. After a quick load-up of the bags and issue of weapons, we jumped on to a coach for a short bus ride to the accommodation, the tents had air conditioning with eighteen to a tent and the ablutions were converted ISO containers, which was much better than expected. There was not enough time to explore more than the laundry tent and the NAAFI before we headed to Kabul. We went straight into a hand-over period from 21 Signal Regiment, getting to learn the local area on foot and vehicle routes to other friendly force camps, on my first foot patrol I experienced the swamping of the local kids, asking for pens, chocolate and anything else they could think of. As myself and LCpl Blundell were positioned at the rear of the patrol, we seem to get all of them. Kids seem to come from everywhere which was a good sign for us as this meant it was unlikely there were any IEDs within the immediate area. Eyes still peeled we moved round a maze of streets, kids in tow I must add! We did manage to give the local kids something by the end of the week, fixing a water pump in the local school. It was not all work we celebrated our first tour birthday by getting the birthday boy (LCpl Ben Sarafis) dressed up in a protection suit and chased by a military attack dog. Not quite the birthday present he had been hoping for but well done for being such a good sport. I also got to perfect my bartering skills in the market getting a watch reduced from $25 to $15. I was quite pleased until the strap fell off the next day. It was starting to feel like Christmas when it all went wrong. Not even the Christmas tree sent from home could soften the first blow. A suicide bomber killed 48 people and injured over 100 others at a festival in the centre of Kabul. SFPTC were to take a back seat and be ready to move if required, giving advice, letting the ANP and ANA take control of the situation. The ANA and ANP handled the situation well, our presence was not needed. The events of the week were a reminder of how the Taliban are still very much present within the area and how they can still manage to influence people into doing such things. A real effort was made to keep spirits high over Christmas. In the morning we were greeted at our guard post by senior personal with a gift to hand from UK4U. This was a surprise and a morale boost. Entertainment was organised in the NAAFI during the evening. During the day the guard shift was covered by senior personal and I finished guard 30 minutes early so we could join the rest for dinner. I think everyone enjoyed dinner, especially the food fight. However, I seemed to pay the price later in the evening. I was starving as I had used all my food in the fight and not eaten much! After dinner it was off to bed for that all important Christmas snooze before going back on guard for the evening. After guard I spent some time talking to my family over the phone which really helped lift my spirits again and then it was back to bed. I did manage to get the New Year off on the right foot distributing aid to the locals and making a new friend Mickey. Mickey is a mouse who is now resident in SFPTC accommodation; he is a little camera shy, but great for morale. With Mickey to keep me company lets hope the rest of the tour goes a fast as the first 72 days! Christmas is now over and the Troop enjoyed the festive period the best that we could. On Christmas Day we had a late start with everyone getting together in the morning to open our presents from friends, family and some kindly donated welfare boxes. It was a very relaxed day with everyone sharing their gifts. That said, there was still work to be done and this was shared amongst everyone, to ensure that we could all take part in the day’s activities. All traditions were met on the day especially Christmas lunch. The chefs put in a lot of hard work and it was a fantastic meal. Once everyone was full from the turkey dinner we departed the table and we went to see Santa. We received a gift donated by ‘UK4U’, which was packed full of little gadgets, followed by a photograph with Santa. LCpl Chris Simpson organised a day of activities for everyone. In true military fashion he turned the occasion into a competition involving our American friends, who work downstairs. The day consisted of a variety of sports and a quiz in the evening. The only thing that was missing on the day was the good old celebratory drink; however this didn’t stop us from enjoying the day. New Year has got off to a good start and it was all quiet with no surprises. 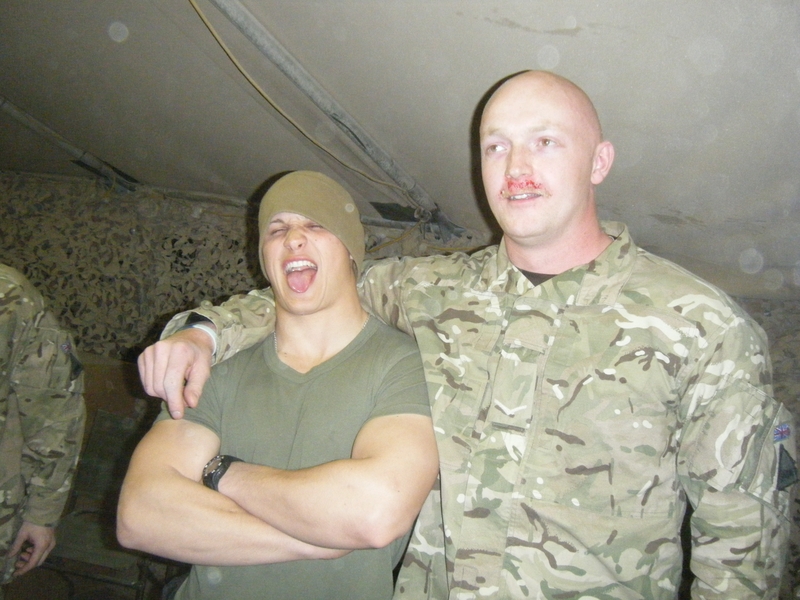 LCpl Beck had grown his moustache in ‘Movember’ and waxed it off for charity. The event itself was successful with him raising about £500 for Help for Heroes and The Army Benevolent Fund. As people gathered round to see the event it appeared that he was starting to get second thoughts. However with the pressure on and in true military fashion, he cracked on and commenced the removal process. With the pain and blood evident he kept a brave face – with momentary lapses. After around five attempts the moustache had been removed. LCpl James Beck has his top lip waxed. Recently, the boss has decided to stop the PT in the mornings, as it is too dark for him to get out of bed. People are happy with this concept as they’re not getting up before the birds start singing. However, he has decided to take individuals out to do PT throughout the working day. So the idea of ‘no organised PT, supposedly implying no physical activity’ doesn’t pass muster with the boss. The OC has also started a charity darts competition for the Troop and the wider Main Operating Base. I am now just about halfway towards my R&R and I am looking forward to getting back to see my family and friends and more importantly my girlfriend. I hope that everyone back at home managed to have a great Christmas and we wish them all a Happy New Year. During December the temperature has dropped rapidly. In our accommodation which was lovely and air conditioned during the summer, the thermostat has now been changed over to heat the room in order to keep us warm. 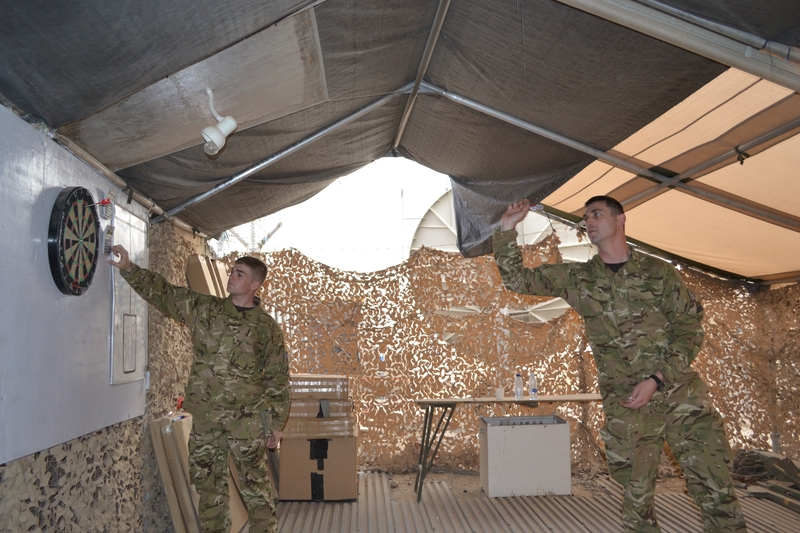 A few of the lads were reluctant to get out of bed in the mornings as it was below freezing, but we are just happy to have some heating, as most Forward Operating Bases (FOBs) do not. The time has also come where members of the Troop are starting to depart on their two-week Rest and Recuperation (R&R). The two-week break back home enables us to relax and catch up with friends and family. 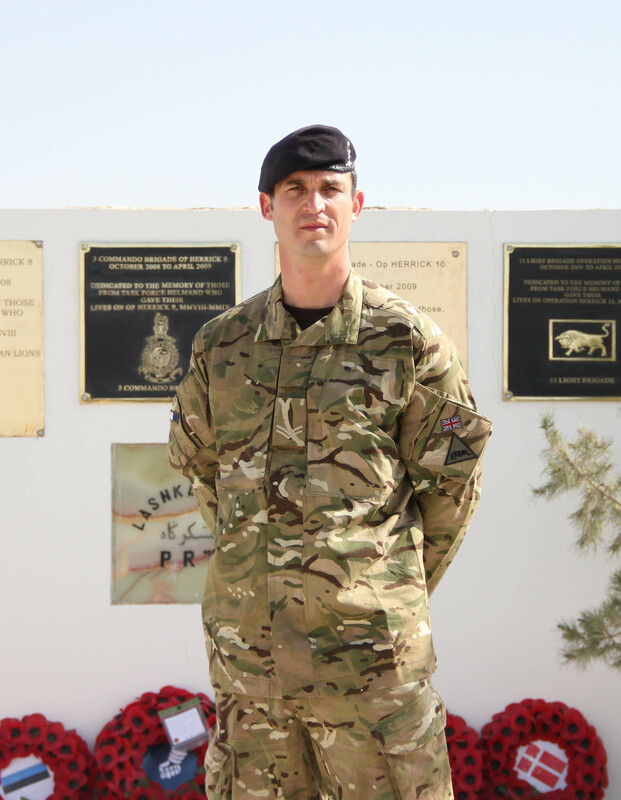 The first two personnel to go are Cpl Andy Southwood and SSgt Paul Smith who will be home for Christmas. For Sgt Taff Lewis this will be a relief as he will be getting much needed respite from the daily banter which has been relentless since our arrival in theatre. 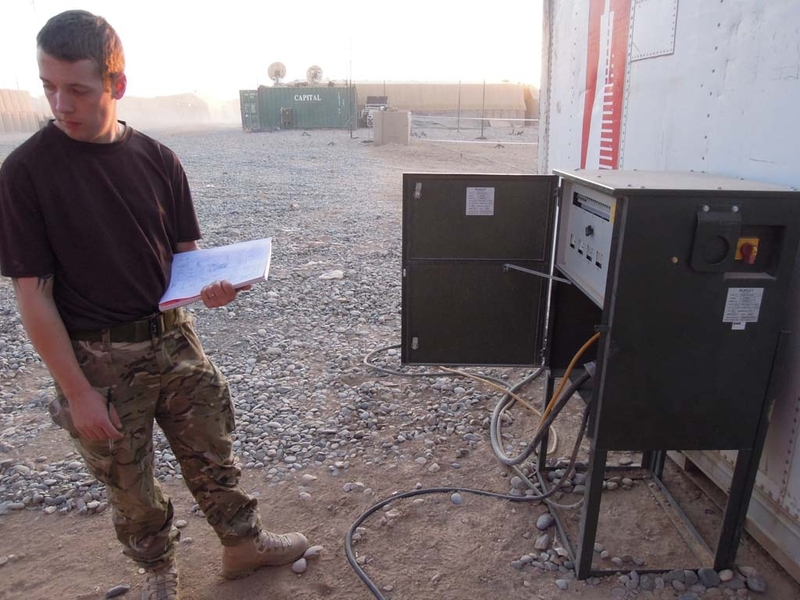 Sgt Lewis and LCpl Andrews have had to deploy out to a number of the Patrol Bases (PBs) that we are responsible for, in order to do some equipment upgrades and engineering checks. LCpl Andrews was not too impressed as he struggled to keep warm during the road moves; as an open top Jackal is not the warmest of vehicles in December. Maybe he should go onto a crash weight gain diet as there is hardly anything to him. We had a rather interesting and amusing morning last week when the boss and I were awoken by an explosion. I jumped out of bed cursing, but I was glad I made it up first, as I managed to see the startled boss don his helmet. He left the body armour off preferring his striped pyjamas instead – very dashing I must say. We then realised it was not so close to our location, but some 500m away. Christmas is now approaching fast and becoming more noticeable as the gifts and presents are starting to fill our communications equipment room. LCpl Chris Simpson is organising a day’s activities for the Troop on Christmas Day to keep us full of spirits and entertained. I’m sure we will have fun on the festive day, although our thoughts will be with our families back home. I would like to say a happy Christmas to my darling girlfriend Carol and sorry for not being home. We are now in December and unlike back at home, the temperature throughout the day is a comfortable 23 – 24 degrees. The Troop has now settled in well and we have started to think of ideas to make the tour a little more enjoyable. The boss, Lt Thorpe, has instigated PT at a bright and early 0600 hours on a Wednesday morning. We conduct our PT early because generally everyone is busy throughout the day. However if there is further time to get away to the gym we make the most of it and do our own ‘Op GET MASSIVE’ sessions. LCpl ‘Tash’ Allonby organised a well received games night for the Troop to further help us relax and spend some quality time together, the night consisted of a number games of poker, with darts in the background. I have also instigated a darts ladder for the entire troop to participate in for the remainder of our 6 months. Considering he wasn’t interested at first, SSgt ‘Paul’ Smith is getting into the flight of things. Although, to date, he has played the most games he still hasn’t left the bottom rung of the ladder. I am now comfortably within a routine working within the communications centre – with things ticking along nicely. Recently I experienced my first sangar fortunately nothing much was going on. The only exciting incident of the duty was observing a pack of dogs moving around and about my sangar position and 3 or 4 vehicles transiting up and down the main road. However, most importantly, I am doing my part for the security of the MOB. Recently, within the troop office we experienced our very own IEDs (Improvised Explosive Devices), with the victim being SSgt ‘Paul’ Smith. He removed a can of coke from the fridge and when he opened it, much to his surprise, it exploded everywhere. He temporarily lost his sight, but the unluckiest victim was the Tp OC, his work area and his bag of clean washing. Unfortunately, we have had to sadly lose 2 members from the Troop, LCpl ‘Shakka’ Hislop and Sig ‘Sam’ Wall; this is due to them being required elsewhere by the Helmand Signal Squadron. We hope this is only for a temporary period and we get them back soon. We have also begun to establish plans for members of the Troop to go and visit some of the deployed communications detachments in the near future. This will enable to meet the personnel that we work alongside and better understand the equipment that they operate.